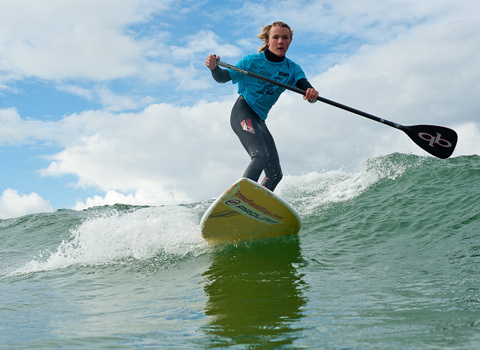 The British Stand Up Paddle Association is leading the development of the sport in the UK. Stand Up Paddle Boarding (SUP) is a relatively new sport which developed when surfers in Hawaii began to use paddles to control and propel their surf boards. The sport is now rapidly growing in popularity across the UK, partly because it is relatively easy to learn the basics and also because there isn’t a huge amount of equipment needed – you just need a board and a paddle and you’re ready to go. You don’t have to brave the ocean waves to enjoy Stand Up Paddling, many people prefer the calmer waters of the UK’s lakes, rivers and canals, and London has plenty of paddler friendly waterways to explore. Inexperienced paddlers should consider wearing a buoyancy aid, and should not attempt tidal or fast moving waters without the necessary skills. As with all forms of paddle sport, you will get a lot more out of Stand Up Paddle Boarding if you invest in a little bit of training to start you off. Experts will explain the paddle strokes and give you advice on starting, stopping and turning. Most importantly, they will be able to show you what to do if you fall of your board and want to get back on again! The SUP race scene is developing in London with Active360 London Paddleboarding and the Blue Chip SUPer Club organising races and regular training events. Active360 are also exploring the potential of kick starting a white water SUP scene using the Thames weirs as a training ground. 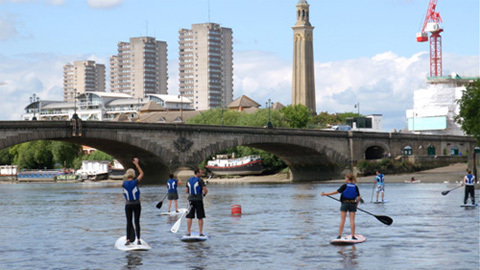 There are plans to create a SUP club in Twickenham and two canoe clubs – Edge at Brentford and Blades at Hammersmith – have already included it in their range of activities. Londoners, or visitors to London who are looking for an introduction to SUP, should check out the links below, for lessons and SUP trips. Stand Up Paddle Boarders enjoy a session with Active360 London Paddleboarding at Brentford Boating Arch on the River Thames.